For any iPad-owning cook, Basil was a great option to consider for the kitchen. And now it just got even better with version 2.0, ready-to-go on iOS 7, which was released today. Before we dive into the goods of the new update, let’s go back to why Basil is great. In my original review, I praised the app for having a clean and simple interface that made it easy to find what you were looking for, since you don’t want to fumble around with a touch screen in the kitchen while cooking. 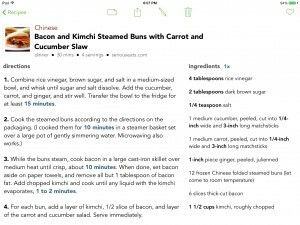 Basil allows users to add their own personal recipes into the app, or save recipes from supported websites with one touch. There was support for some of the biggest recipe sites on the Web, like Epicurious, Serious Eats, Food Network, and more. Basil also featured smart timers, which was an incredibly useful feature that helped it differentiate itself from the competition. If a recipe has time-based directions, all users had to do was tap on that step to bring up a separate timer, that was all set and ready to go. It eliminates the need for a separate timer or switching between apps. Since the original release, Basil has gone through numerous updates. These updates brought more one-touch saving support, unit conversion, search, photos, Dropbox import and exporting, support for adding notes, and checking off used ingredients. And now we are at another milestone in Basil’s lifetime: version 2.0. 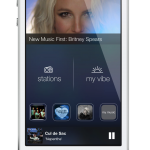 This version brings with it a brand new design, making it even feel like a new app. This new interface was made to better fit the schematics of iOS 7, and that’s exactly what it does. Gone are the tabs, and now your recipes show up as cards that prominently display your recipes. When you view a recipe, you’ll find a view that is similar to the original Basil. However, there’s a subtle change that may not seem like much at first, but it really adds a nice, personal touch to every user’s Basil book. 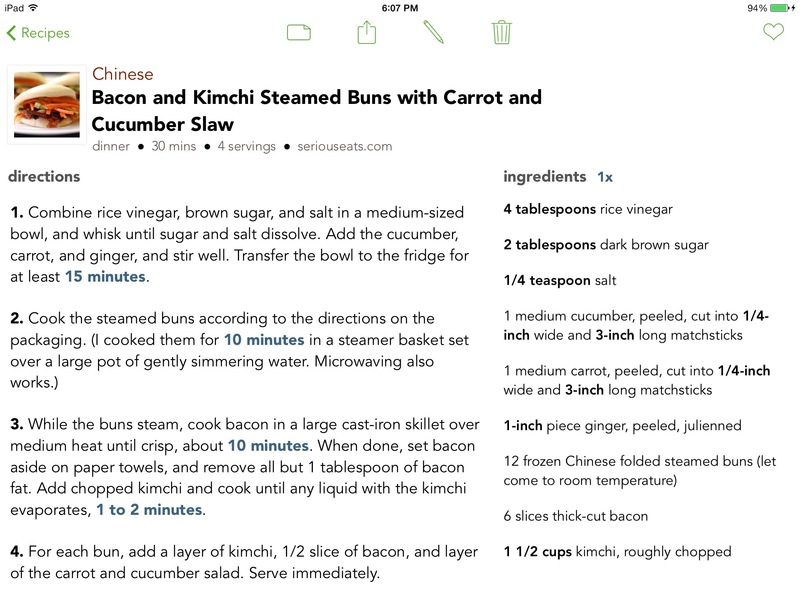 The recipe view will create a unique color scheme for the attribute text, which is based on the recipe’s photo. The text is still very readable, and it’s quite a subdued change, but it’s one step towards making Basil yours, and not just an identical app on every device. Now, to search through your recipes, you can make use of the Filter Bar at the top. 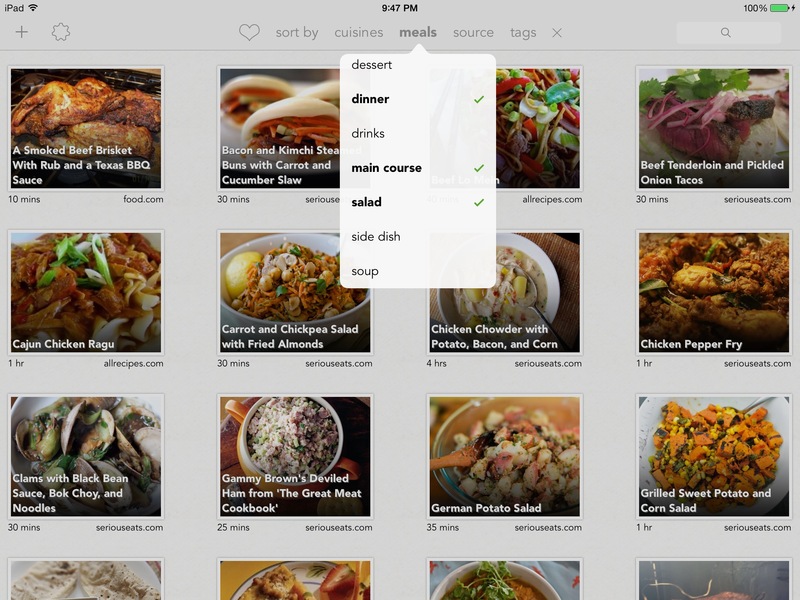 This allows you to sort them, filter by meal and cuisine types, tags, source, and favorites. Of course, if you’re looking for something specific, search for it! You can do complex searches like “My breakfast recipes with bacon from Serious Eats,” or something to that effect. Basil’s Smart Timers get even better, as users can now run multiple timers at once, and they will continue to work in the background. So you can look something up in Safari, but still get notified of when your timers are done. The final big addition in 2.0 is the fact that you can now export recipes as plain text files to Dropbox. This is for those times you want to get your recipes out of Basil, and perhaps share them with someone who doesn’t have the app. 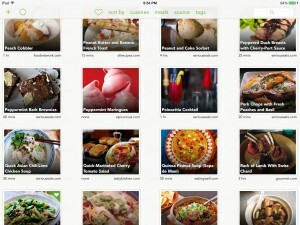 Basil is a nifty digital cookbook app for your iPad that continues to get better with each and every update. It’s a fantastic app to have alongside you in the kitchen, and now it’s completely ready for Apple’s latest version of iOS. 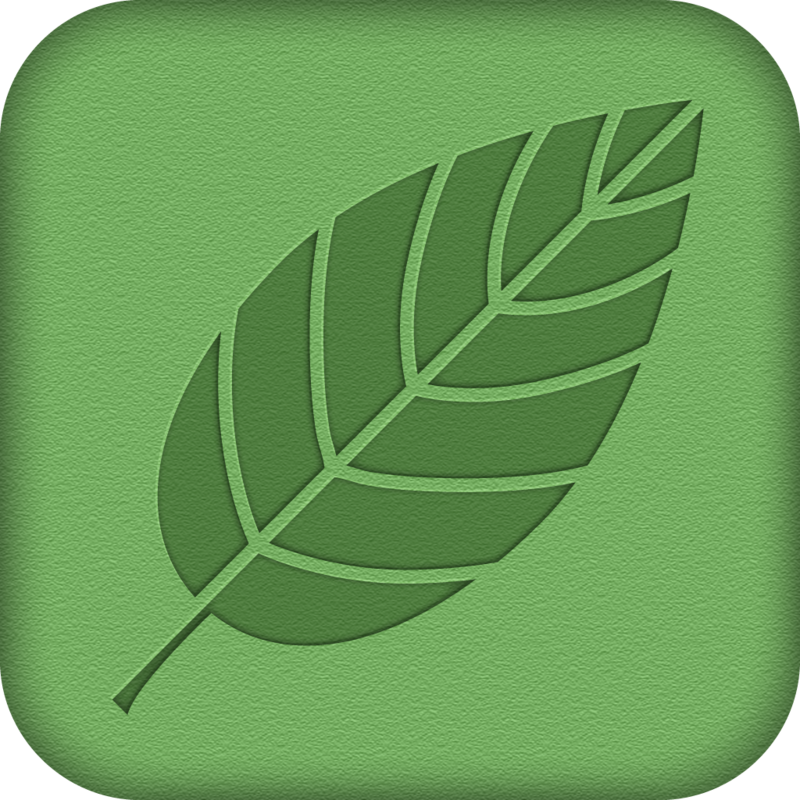 Existing customers of Basil can update and get version 2.0 for free in the App Store. New customers can find it in the App Store for $2.99. Basil: Smart Recipe Manager. Save and Organize Your Recipes!